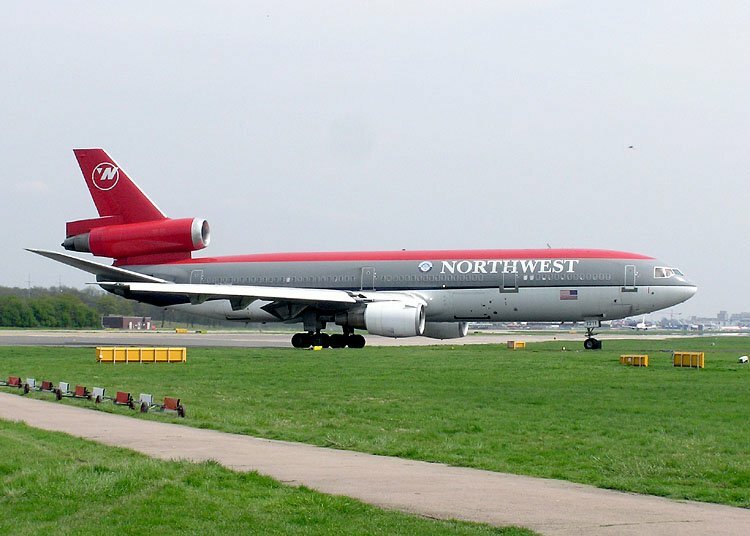 If one of the things on your “Must Do” list was to fly one of the old Northwest Airlines’ DC-10s across the Atlantic, I’m afraid you waited too long to do so. Sunday marked the final Northwest scheduled trans-Atlantic DC-10 flight. Ironically, (or fittingly?) the flight was cancelled due to maintenance issues. All of Northwest’s trans-Atlantic flying is now done on Airbus A330s. You forget how big these things are, and how huge that tail section is, until you’re taking off behind one. Leaving Dallas-Ft.Worth International a couple of weeks ago, I was in a Maddog that was taxiing behind a FedEx DC-10. Got to watch it rumble down the runway and finally go airborne before we made the turn. I’m one of the last Northwest DC-10 pilots and flew my last trip to AMS a couple weeks ago. I was supposed to go MSP-LGW this week but, since the company can’t train pilots fast enough has a surplus of DC-10 pilots and so reserve pilots never fly. The company “bought” my trip to give a reserve pilot landing currency so he wouldn’t have to go back through simulator training before it was due. The DC-10 is a great flying airplane but is a fuel hog, can’t do many of the new “glass cockpit” arrival and departure procedures common in Europe and Asia, and doesn’t have anywhere near the passenger ammenties of the A-330. And, since they’ve been sold or will be parked, have not had good maintenance in the US (the KLM mechanics love the plane and took good care of it as long as they had the parts to do so). At least my last landing was one of the few true “grease jobs” I’ve ever made (the DC-10 is the easiest landing airliner I’ve ever flown, even easier than the A-319/320 if that’s possible). It was a real joy to hand fly it and the three man crew made life real easy in that the engineer could take care of all the flight attendant grips but the downside is that we can go 12 hours without a break so we were in the seat the whole flight, unlike the A-330 guys who will get a couple hours in their bunk. In fact, the biggest thing I look forward to as I transition to the 747-400 is a bunk!